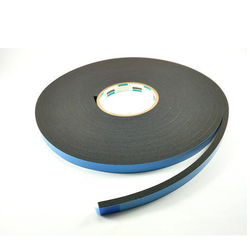 We are a leading Manufacturer of industrial spacer tape from Chennai, India. We offer a wide range of Spacer Tapes, with cross link PE foam, which are used for various structural glazing applications. These tapes are coated with high tack pressure sensitive adhesive on both the sides, are of normal density. Our tapes keep the glass in its position properly with aluminium frame while the sealant is applied and cured. Looking for Industrial Spacer Tape ?